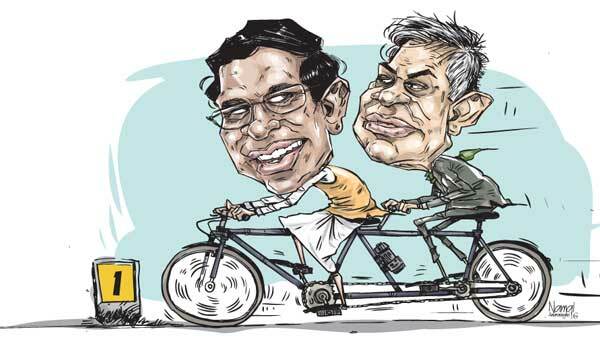 Today, August 17, marks the completion of one year since the 2015 general elections which led to the appointment of a National Unity Government between the two major parties -- the United National Party (UNP) and the Sri Lanka Freedom Party (SLFP) which had ruled Sri Lanka separately for the 68 years since independence, the UNP for 33 years and the SLFP for 35. After last year’s elections where the UNP won 108 seats, five short of an overall majority of 113, the two parties, in consultation with former president Chandrika Bandaranaike Kumaratunge, signed a memorandum of understanding to form a national unity or consensus government for at least two years. Another positive feature was the election of the Tamil National Alliance (TNA) Leader R. Sampantham as the Leader of the Opposition and the Janatha Vimukthi Peramuna (JVP) Leader Anura Kumara Dissnayake as the Chief Opposition Whip. A major negative feature however, was the move by the United People’s Freedom Alliance dissident faction loyal to Mahinda Rajapaksa -- who was defeated both in the January 2015 presidential election and the August 2015 general elections -- to form a so-called ‘joint opposition’. Government leaders are accusing this ‘joint opposition’ of trying to disrupt or sabotage the long-term development strategy of the government by opposing almost every move including last week’s Bill for the setting up of a wide-powered Office of Missing Persons (OMP). Last month President Maithtripala Sirisena, Prime Minister Ranil Wickremesinghe and former president Ms. Kumaratunge -- widely seen as the ruling trio -- decided that the National Unity or consensus government should continue for the full term of five years. At present the Government admits it is facing a major financial crisis with a debt burden of a staggering Rs.8,000 billion -- most of it taken at high interest rates by the former regime. That means every Sri Lankan is in debt to the tune of Rs.500,000 and that for every Rs.100 that the country earns, as much as Rs.97 has to be repaid as loans and interest. Mainly as a result of this and also because of disjointed planning, with different ministries doing or saying different things, the Government has been unable to curb the soaring cost of living. The ongoing crisis and controversy over the Value Added Tax (VAT) is one instance of the left hand not knowing what the right is doing. With the signing of a new agreement with a Chinese company for the setting up of the International Financial City Project, a new name for the widely-condemned Colombo Port City Project, Premier Wickremesinghe who is in China is likely to outline soon the long-term strategy for sustainable eco-friendly and all-inclusive development. Another major promise was that the former regime’s VIP politicians and officials who allegedly plundered billions of rupees would be brought to justice and the money recovered. But more than 20 months after last year’s presidential election, the process of indictments or prosecution has been painfully slow with some activists asking valid questions whether there are still some back-door political deals. Since last month however, the investigations and Court action have been speeded up. In one such case a political business tycoon is to be indicted next month on charges relating to the abuse of hundreds of millions of rupees received as aid in the aftermath of the 2004 Tsunami. For the past year the SLFP General Secretary and other leaders have been saying disciplinary action will be taken against party MPs who are blatantly violating the party constitution. The dissidents are also whipping up racial or religious tension, the latest being the allegation that the Government is considering a change in the constitutional provision where the State gives the foremost place to Buddhism. President Sirisena has repeatedly denied this. Over the weekend he said in a TV interview that the dissidents were making this allegation based on some ideas proposed to the Lal Wijenayake committee which had interviewed hundreds of groups on their views relating to the proposed constitution. These views were printed in a large book. The President reiterated that the ideas of some groups for a secular state were not even being remotely thought of by the Government. We hope the so-called ‘joint opposition’ and other critics would in future check their facts and figures before making charges that could provoke another disastrous war which no sane person wants.